Pick a Pumpkin Blog Hop! Carla, at Creatin’ in the Sticks put together a fun pumpkin hop just in time for all the lovely fall colors. It’s been a beautiful fall here in the Pacific Northwest with leaves scurrying across sunlit streets as I drive to work in the morning and occasionally that beautiful shade of fall blue sky with white clouds scudding quickly accross that just makes fall one of the most beautiful times of the year. So, I’ve been working hard on my UFO’s and I had a little pumpkin just waiting to be a finished. I was inspired by Bonnie Hunter’s string pumpkins when I was watching her Quilt Cam. I thought about doing an entire quilt of pumpkins but realized that there will have to be a LOT more orange in my stash before I can attempt it. No, seriously, I came up with about three orange strips in my 2″ strip bin…there may be serious shopping ahead! So, I made a little pumpkin pillow to go with my recently finished “BOO!” top! And, speaking of shopping…this quilter is going to…wait for it…Houston! For the Quilt Festival! To meet up with a bunch of the Just Wanna Quilt Quilting Army! OK, I am officially excited! (Except when I’m officially nervous! lol) There will be many, many photos coming so keep watching. In the meantime, go and visit the super talented group of quilters that have fun pumpkin projects to share! It’s been one of the hops I look forward to ever year…the Halloween Hop from Marian at Seams to be Sew. I don’t know if people realize how much work goes into putting on a hop but Marian is the soul of graciousness and so fun! And, of course, special thanks to the Fat Quarter Shop and Timeless Treasures for their generous sponsorship. So, my Halloween quilt….about four years ago, I won a fun basket of Halloween fabrics at the door prize drawing at my quilt guild. And, of course, with all the fun, spooky fabric…I needed to make a quilt! Perfect for the Halloween hop, right? Let’s just start with cutting everything into 2″ strips and start there. I had been working on a combination of stars and squares and thought I’d just whip this up for Halloween. Well, I realized I would miss the deadline so I decided to make an alternate Halloween piece. 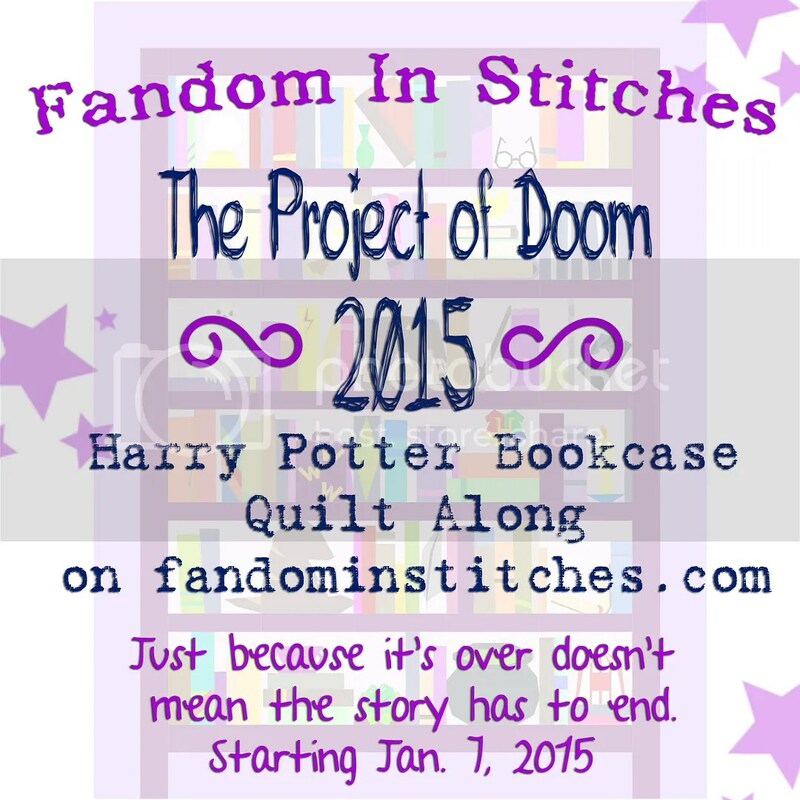 The next year, I was sure I’d get finished but, well…not so much. Last year, I put year 2 together with my progress and this year…it’s a flimsy!!! Now, there’s a fun giveaway going on…a wonderful bundle from the Fat Quarter Shop. You can click here to enter. And, there’s more! There’s an awesome fabric bundle from Timeless Treasures is up for grabs here. And, on top of that, there’s a free pattern at Seams to be Sew each day of the hop! Sew much fun! Thanks so much for hopping by and stay tuned…there is much fun coming up! Show and Tell…a finished one! A quilty kitty bookcase. Suitable for hanging on your wall or cuddling on your couch. (Daughter not included. ) This is the first time I’ve finished my show and tell effort and I’m so excited to have it done! (OK, full disclosure…I need to finish hand-sewing down the sleeve.) I tried the wavy organic lines on the quilting and, while I love how it looks, I have to say that I couldn’t get my walking foot to not threaten puckers so I did them free-hand which was kind of stressful. If there’s interest, I’ll be happy to post directions but, in a nutshell, I just raided my scrap strip drawers and made random sizes…books were 7″, 8″, 10″ or as small at 6″ finished with enough background to create a 12.5″ unifinished book. I added another 2.5″ book to the original row and the quilt finished around 40″x50″. 2.5″ brown strips between the rows made shelves and I think I used just about every inch of the lovely Northcott fabric I used for the background! There’s a giveaway today, too, from the wonderful Fat Quarter Shop! (A $25.00 gift certificate!) We just couldn’t have had all this fun without Marian at Seams to be Sew and be sure to check out her blog for more fun things coming up! And many, many thanks to our sponsors…you all are the bestest! You can enter here. But don’t wait too long! Be sure to visit the other designers…everyone has been such fun on this hop. I can hardly wait to see what next year brings! And that’s everything for now! 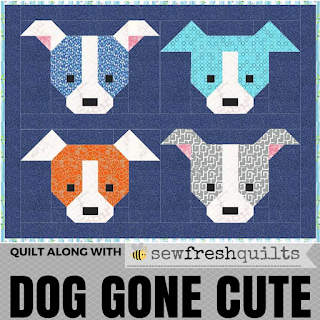 But come back soon, there’s lots more quilty fun coming up! First, before we talk about my happy place, let’s give credit where credit is due…Marian at Seams to be Sew puts a TON of work into organizing this row along and she is just the best to work with! And Northcott, well, let’s just say that they are the best, too! Every designer in the hop got to choose fabric to put in their row…which might have been the hardest part of the process because, oh my, there was some amazing stuff! And even more sponsors came on board to make this a fun and prize-filled event! I have the awesome opportunity for one reader to win an inspired LED sewing machine light! (I’m thinking I really need one of these! You will need to pay shipping if you win…but still, imagine having all that clear light under your needle!) You can enter here. You can also enter to win an EQ8 here! If you’ve never played with quilting software, well, let’s just say it is almost as fun as sewing! I’m telling you, we have such awesome sponsors and I’m so grateful for their support of this hop! Now, I must admit that I sometimes feel out of my depth with all the amazing designs that come out of this hop. I’m really a piecer and I cannot fuse to save my life! (I also can’t grow zuchini…go figure!) And I’m a novice designer so I tend to do things that a beginner can do. So, what else makes me happy? Books, of course! Ever since I was little, books were where I went to find a happy place. I spent hours reading and re-reading my favorites and wishing I could slip away into Green Gables (surely Marilla and Anne would take me in? ), solve mysteries with Freddie and Flossie (I was blonde, too, would they really notice?) or slip into the garret with Jo March where we would scribble away at the novels that would bring us fame and, more importantly, our names on the spines of books! My love of books never diminished and so I decided to blend the two in my row. This is my row…books & cats! 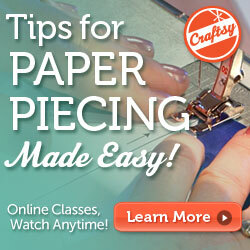 It’s simple with straight-forward piecing. However, it’s very versatile and I’ll look forward to showing you what I made with it next week. If you’d like to download the instructions, you can get them here. I really hope you like my little row, it’s simple but quick and fun and great way to use up fun fabric bits. My fabric from Northcott is the background (9020-10 with the beautiful textured look) and Northcott’s Naturescape blue (the beautiful watery blue)and, co-incidentally, the grey cat is made from leftovers from last year’s Northcott fabrics that I used in my Silver Bells row. Please be sure to visit our sponsors and let them know you enjoyed the row hop! I’ll see you back here in a week with my show and tell quilt…it’s already basted and ready to quilt! This is sort of what my face looks like on the inside when I’m rushing around like a crazy lady! So here’s the happy dance list and there is a lot, lot, lot of happy dance! 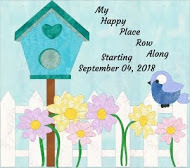 My Happy Place Row Along! It’s started, it’s a thing, it’s fun and free and fabulous and my day is coming! (Schedule posted below.) There are amazing prizes so check them out! I’m going to Houston for the Quilt Festival! 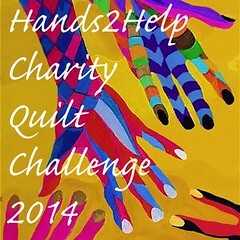 I’ll be volunteering in the Just Wanna Quilt Booth so let me know if you’re going! I’m on a podcast! Bip over to Just Wanna Quilt and listen. Elizabeth Townsend Gard is soooo fun to listen to! I’m losing it…in a good way! On August 13th I stopped eating sweets and I am actually seeing some results! And that’s not as easy as it sounds when you’re a middle-aged woman with thyroid issues! I still need to work on more veggies in my life but I cut out sweets…candy, cookies, cakes, sugary drinks…which is a major accomplishment when you spend 12-25 hours each week selling really good chocolate! Really, chocolate was pretty much the base of my food pyramid. And, of course, there needs to a kitty picture just for fun…this is Milo hanging out of the ironing board…helping, of course! The wonderful Carol at Just Let Me Quilt has put together another fun hop! Of course, my life is always pretty much the Festival of the Last Minute and it’s here and, well, I’m very close to done! Is anyone else old enough to remember the days when women would set their hair in curlers and sometimes have to run out to the grocery with a scarf tied around the knobby evidence of their upcoming important event? Well, my little quilt reminds me of one of those ladies in their colorful scarves. I was just sitting down to hand-stitch the binding when I was called into work rather urgently. So, here’s my cute little quilt with its wonder-clip accessories. I could totally see myself making an entire quilt of the house blocks but, um, that would defeat the “I finished a UFO” concept. However, I do have an amazing set of house blocks from an exchange years ago. So, in other news, I’ve gotten very into a new podcast I found called, “Just Wanna Quilt.” I’m having a blast binging on the back episodes and there is an amazing interview with Tula Pink and Mary Fons! You can find the podcast in a variety of places but I found mine on an app called Stitcher. (No affiliation, I’m just newer to podcasts and you might be, too.) The best thing about these podcasts is that I feel like I get to hang out with other quilters right in the middle of my ridiculously busy life. Driving back and forth between jobs is so much more fun now! So, that’s all for tonight. I’m heading to bed because I have about six hours to re-charge before running back out the door. 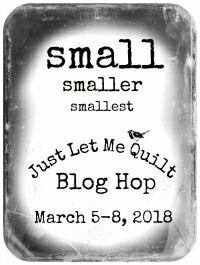 Be sure to hop over to the other great bloggers and drop back at Carol’s place at Just Let Me Quilt to enter for a great prize! Words & Stitches – That’s me! It’s here and I’m late!!!! First week of having students back in school was busy, busy, busy but fun! I’m so excited this year to have a PIC (partner-in-crime) working in our other school site which makes my life so much better! Just not having to change campus every other day makes it so much less hectic! Today, I’m enjoying a 1/2-day off from job 2 and I have a little quilt to finish binding for tomorrow’s blog hop. Anyway, before I run off to bind, stop by these talented designers and start picking up some fun rows with no travel required! And dinner with hubs and the girls. These two who are fresh back from their trip to Greece..
Now, about the freebies….I love, love, love the amazing patterns and tips and tricks that people share on the internet! Quilters are, in my opinion, some of the most caring and generous people you’re ever going to meet in life! Fun, right? everything but the kitchen sink in that one! I’m debating if I want to add on to it to make it bigger…I’ve still got plenty of scraps. So many that I’m nearly finished with my first Scrap Vortex from over at Crazy Mom Quilts. You’ll find everything you need in the instructions on Crazy Mom Quilts to make your own vortex….caution, it’s addictive! Also, Samelia’s mum just posted a rainbow scrap that is a fun improve pieced quilt, too! Third is a special one for me because both the fabrics and the pattern were free. A bunch of time ago, I brought home a stack of 2.5″ wide purple and green stripes from the guilds’ free table. Bonnie Hunter’s scrappy trips were all over at the time and I decided to try a controlled look. By placing the light and the green in the same spot, I got a very controlled look that still has fun with all the purples! I love how this is coming out and can’t wait to make more! This is another of Bonnie Hunter’s free patterns. 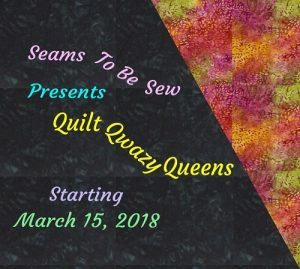 Now, when I add a Frankenbatt (that’s what I call it when I stitch leftovers back together with a wide zig-zag until I get enough to use) and an on-hand backing …the whole quilt will be free! Of course, my theory is that if you make it out of what’s on hand then it’s free. Obviously, fabric depreciates rapidly! 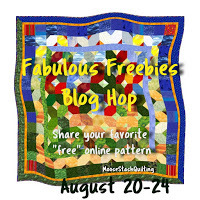 Check out my fabulous friends for more freebies and thanks to Joan at MooseStash Quilting for pulling all this together! I’m still not sure where the time went! Then we got up at a ridiculous hour and flew to Oakland. We made a trip to San Francisco for lunch before heading to Phil’s hometown of Folsom. Had lunch at House of Nanking which offers awesome gluten free options. Saw turkeys wandering the neighborhood! Great breakfasts on Sutter Street! I love this picture of my guy! Wonderful friends…. these guys have been friends for decades! Met this cute mustached kitty during a visit in a lovely garden. And, of course, no travel is complete without a quilt shop stop! This sweet guy didn’t even try to bar the door…. We came back on Monday and I went right into work mode. But I have today off and it just happens to be the day of the quilters yard sale at Pioneer Quilts. I got so much fun stuff! This post is so long, I think I’ll put my treasures in the next post. OK, I love, love, love Christmas but ever since I started the second job in the candy store (on top of the full time job) I’m having more trouble getting everything I want to do done. So, July is really the time for me to start! But, even in the slow season, I’m working a whole lot so I needed a quick gift that I could craft in a small amount of time. I’m also really big into practical gifts these days. I mean, why not craft something that can be used and loved? So, of course I jumped in when Carol at Just Let Me Quilt offered a reason to push my Christmas crafts to the top of the to-do list! I really, really appreciate everything that our blog hop coordinators due. These blog hops often give me a chance to push being creative to the top of my otherwise too full to do list! Then I stitched a 1.5×2″ rectangle to two 1.5″ squares to make a top for my ornament…ah ha…see, it is a Christmas something! I used my tri-recs ruler to cut this 5.5″ tree, added a small trunk and used the same backing and binding…. He’s really good at holding fabric down! There’s a great group of quilters to see today and I was hoping to share a super cute movie that my google photos generated with my pictures from the Sister’s Quilt Show but it doesn’t seem to be working. I’ll try to get it going on my instagram and add a link if I do. Thanks for dropping in and enjoy your day!